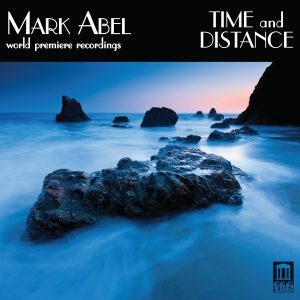 The Journal of Singing Reviews Mark Abel's Time and Distance | Delos Music | Outstanding Classical Recordings for over 40 Years! Mark Abel is one of our most accomplished art song composers, with an impressive body of work that grows by the day. One hallmark of his legacy is his artistic adventurousness; he is a composer with bold and ambitious ideas and the resourcefulness to nearly always bring those ideas to full and effective fruition. His latest collection … marks a new level of excellence we have not seen before. sometimes dangle from the bottom rung. All the while echoing the saddest songs we’ve sung. Abel was a professional journalist for more than two decades, and clearly his work as a composer is richly informed by his keen interest in societal issues and concerns well beyond the arena of music making. … Nothing he writes is accidental or arbitrary; he is a meticulous craftsman who obviously cares deeply about the songs he writes and shares with the world. May there be many more to come.